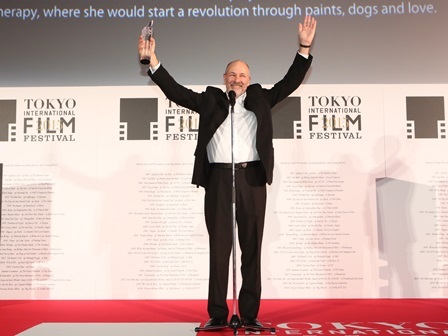 Winners for each section of the 28th Tokyo International Film Festival were interviewed on October 31 after the closing ceremony. Director Roberto Berliner from the Brazilian film Nise – The Heart of Madness, which has been crowned twice, once with the Tokyo Grand Prix, and once for Best Actress (Gloria Pires), said “even from when I was making the film, I got the feeling that I was dealing with something special. Part of me was expecting it, but then again I have won out of a lot of other wonderful films”, feeling renewed joy. The film follows the bitter struggle of real life female doctor Nise da Silveira who incorporates art therapy into her treatment in an era of a male dominated society where shock therapy was seen as important. Research for the film started 13 years ago, and after the director anticipated at the beginning dropped out, Berliner took it upon himself to put on the director’s hat. “I grew friendly with the schizophrenia patients who lived in the same time as Nise, and her existence slowly became more and more real. There were people who told me I should just give up, but she is a person who has played a very big role in Brazilian psychiatric care. I thought that this was a story that simply must be told. And I think it turned out pretty well”, he said with satisfaction. Pires, who won Best Actress, is a veteran actress popular in Brazil. A different actress had been decided upon for her role too at the start, but she dropped out for health reasons. Apparently they sent the screenplay to Pires through a mutual friend, but she did not read it. However, “Pires’ husband read it, and urged her that she simply must do it, which is why she took on the role”, he said, revealing the story. Apparently director Berliner has sent the news of the award by email, but due to the time difference “it seems she was asleep, so there’s no reply yet”, with a teasing laugh. “Thanks to her presence in the film we were given the chance to go from being about a medium scale film to being a film that is going to continue to reach different parts of the world”, he said happily. Director Edoardo Falcone, whose Italian comedy film God Willing was chosen for the Audience Award, said “this film has an Italian soul, and you have welcomed it with love. I am really glad that I am able to be here, when everyone is laughing and feeling the emotions of it”, he said with a broad grin. Director Hiroshi Shoji whose film Ken and Kazu was awarded the Best Picture in the Japanese Cinema Splash section said that “I wanted to make the number one film in Japan. It only took about 2 million yen to make, but I think it was a clear choice. I want to become a director worthy of the Tokyo International Film Festival”, he said, feeling renewed.